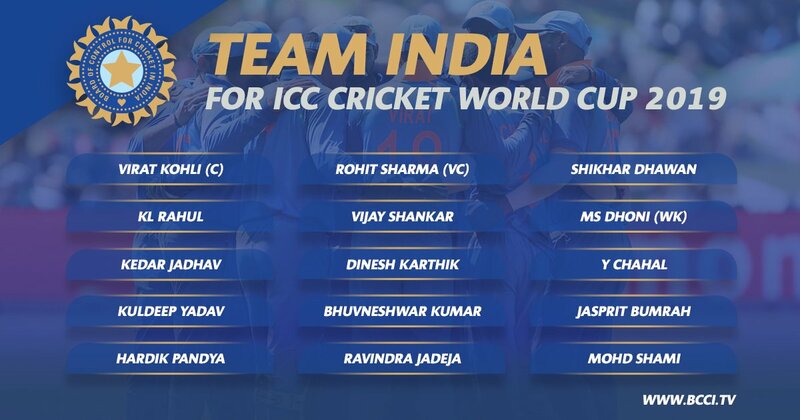 Board of Control for Cricket in India (BCCI) today announced 15-memeber squad for the ICC World Cup 2019, to be played in the UK from May 30, 2019. Virat Kohli will lead the squad, which was announced in Mumbai on Monday. While there were no major changes in the 15, the inclusion of Dinesh Karthik was the notable factor was Rishabh Pant was the surprise exclusion. The announcement had been awaited with great anticipation, especially since it was announced about a week ago, with most of the conjecture surrounding who would be India’s crucial No. 4 batsman. The squad was announced by the Board of Control for Cricket in India (BCCI) Chairman of Selectors MSK Prasad.